Our topic this half term is ‘Water, Water Everywhere!’ We will be investigating all the places where water can be found and what we use water for in our everyday lives. The class will learn about the water cycle, what life is like for children who live in countries that suffer drought conditions and ways in which we can save water. We will learn about water safety and have fun with water play. The topic work will also include water based art and science activities. as spotted. Is that really a shark he can see? 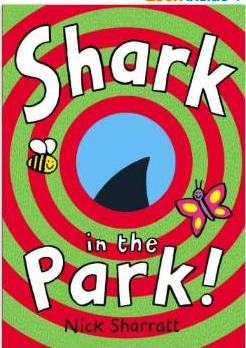 We will follow this with non-fiction books based on sharks and a week of water poetry to link with our topic theme. This half term our Topic is ‘Rule Britannia’ and we will be focusing on a different country that makes up the United Kingdom each week. The children will be learning about famous landmarks, people, food, music, dance and sports associated with them. We will also be looking at what life was like for children in Victorian schools with visits planned to Wardown Park Museum and the Victorian school experience at the British Schools Museum in Hitchin. Information on all trips will be sent out shortly in the home school books. 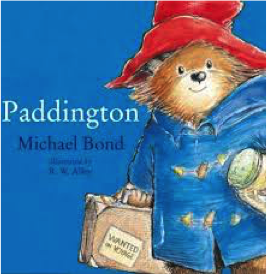 This half term we will be reading and basing our Literacy work on Paddington Bear by Michael Bond. The class enjoyed reading The Smartest Giant in Town and by the end of the half term could all contribute to retelling the story in a way that suited them. We covered many different areas of Literacy through the book; story maps, writing adverts, labelling, making lists and using story props. Our topic focus this half term was ‘We all go travelling by’ and it had a strong transport focus. We learnt about different types of transport each week through Art/DT, trips, videos and role play. It linked in with our ICT focus on presenting information and the children each made a PowerPoint on transport. Through this they have experienced the skills of adding new slides, typing in headings and labels and adding pictures from clipart and the internet. Some of the class science this half term also linked to the theme of transport. We made paper aeroplanes from different materials to observe which flew the best. Using the ramps at different heights we investigated and measured how far we could get a toy car to travel and using wooden blocks and card built bridges to see how many cars they would hold. This term our Topic is 'We all go travelling by' where we will be looking at different types of transport and hope to go on trips out using these. Other parts of this topic include a focus on road safety, being a good neighbor and ways that we can improve our school environment. The first part of this half term we are using ‘The Smartest Giant in Town’ as our book and it links in with what makes a good neighbor. Book blurb: George wished he wasn’t the scruffiest giant in town. So when he sees a new shop selling giant-sized clothes, he decides it's time for a new look: smart trousers, smart shirt, stripy tie, shiny shoes. Now he’s the smartest giant in town . . . until he bumps into some animals who desperately need his help – and his clothes! In the final week of this half term we will look at a range of non-fiction books linked to our topic on transport. In numeracy we will continue focusing on the key areas of number, shape, space, measure and using and applying. Some of this will be linked into our topic as we plan to carry out traffic surveys making simple pictograms and tally charts. We will be looking at position and learning to programme the 'Bee bots' to move around floor maps. Our science for the half term will be looking at forces including push, pulls, rolling, spinning and floating and sinking. We will investigate these through fun and practical investigations. In ICT for the whole term we will be looking at 'presenting'. We hope that all children will create their own PowerPoint presentation on transport to show to parents at a coffee morning. Details to follow. This half term our topic has a history focus and is called Kings & Queens. The children will experience investigating different aspects of the past through famous monarchies, music, portraits, castles, royal crests and clothes. Our science focus is Sound and we will investigate making different sounds and adjusting their volume, getting sounds to travel and making musical instruments. Our Literacy books this half term are traditional tales, The Emperor’s New Clothes and The Princess & the Pea. Let me introduce you to Diamond Class… I am Jenny the class teacher, Hannah is our TA2 and we have Charlotte, Katie, Carol and Mandi as teaching assistants. The pupils in Diamond class are: Abigail, Callum, Destinee, Luke, Kieran, Jeremy and Huma. This half term our topic is Fit as a Fiddle, which focuses on keeping healthy, exercise, hygiene and changing and growing. In class we will be tasting healthy foods and learning to sort food into healthy and unhealthy groups. We will be focusing on hygiene and self care, for example looking after our teeth. The children will be learning to name key parts of their body and face, with some understanding what function they have. We will focus on taking part in different forms of exercise and looking at how we change as we grow up. Our Literacy books this half term will be I will not ever never eat a Tomato by Lauren Child and Peas by Andrew Cullen. Amazon Review: Lola will not eat peas. In fact, she won't eat carrots, potatoes, mushrooms, eggs, sausages, cauliflower, cabbage or baked beans. And she will absolutely not eat a tomato. But when Charlie explains that peas are actually green drops from Greenland, and that carrots are orange twiglets from Jupiter, even Lola is tempted to clear her plate. An innovative and fun-filled look at the problem of fussy eating, I Will Not Never Ever Eat a Tomato is guaranteed to make dinner time fun. 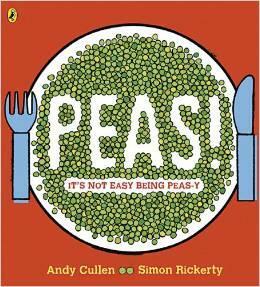 Amazon Review: It's not easy being a pea! Picked, plucked and processed, and then transported all over the world on trucks, trains, boats and planes, Pete and Penelope Pea finally find a loving family to feed. But do the little girl and boy actually like peas? Go on, give peas a chance! A book that will have children bursting with questions about ecology and the environment. 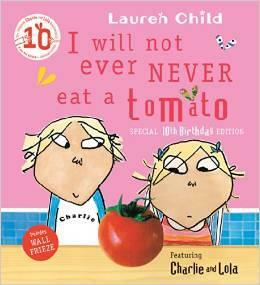 In Literacy the children enjoyed the two books we covered last half term, I will not ever never eat a Tomato and Peas. The children produced a lot of work around these including; zigzag books, lists, their own story pages, seed packets with instructions and poems. Our Fit as a Fiddle topic had the class learning about different foods and exercise, which help to keep our bodies and teeth healthy. They learnt to name and label key parts of their face and body and identify key stages in the human life cycle. The class enjoyed fun and practical science lessons, focusing on their ability to discuss and record what they had observed during the experiments.